Virgin Galatic rolls out mothership "Eve" at Scaled Composities in Mojave on July 28, 2008. MOJAVE,Calif. — With all the pageantry of a king?s arrival, the WhiteKnightTwo — ahuge flying launch pad to support passenger suborbital space travel — madeits public debut here Monday. The rolloutof the colossal composite plane signals the first phase of a critical testprogram to establish a privatespaceliner business — a venture being bankrolled by British entrepreneurand billionaire, Richard Branson and his Virgin Group. Lookinglike a giant catamaran for the sky, the twin-boom, two individual fuselages aretopped by a large, 140-foot (42-meter) long stretch of wing. The aircraft willstraddle and carry to drop altitude (around 48,000 feet) the SpaceShipTwo — asix passenger, two pilot craft that, once released, will rocket pay-per-viewpassengers to some 65 miles (104 km) above the Earth. ?This is abig airplane,? said Scaled Composites founder, Burt Rutan, and Chief TechnologyOfficer and Chairman Emeritus of the company. ?It is not an inappropriate claimto say this is the largest all-composite airplane,? he told SPACE.com. Once a screen stretched across a hangar door — adorned with the projected Virgin Galactic logo of an eye — fell to the ground, the seated audience came face to face with WhiteKnightTwo positioned on the outside tarmac complete with Branson and Rutan waving from separate windows on the carrier craft.SpaceShipTwo, still under construction, was shrouded in a large black tarp just a few feet away during the unveiling of WhiteKnightTwo. The carrier aircraft has been christened "EVE" in honor of Sir Richard's mother. Fourturbofan jet engines power theWhiteKnightTwo, an aircraft that has more capability than needed forSpaceShipTwo operations, Rutan explained. The mega-plane has undergoneextensive computational fluid dynamics (CFD) testing, he said — that?s aerodynamicspeak for utilizing electronic wind tunnel evaluations versus wind tunneltesting. WhiteKnightTwois the 40th aircraft of varying types to be rolled out by Scaled Composites,Rutan said. ?I think that?s more than you?ll find in any other company by alarge margin.? "The beauty of WhiteKnightTwo and SpaceShipTwo is that they can help change our relationship with space," Branson said after the rollout. "The other thing that I admire about the system is that it has the architecture that would someday be developed into passenger carrying vehicle able to take people from A to B around the planet, outside of the atmosphere at near orbital speeds." Branson said he thought it was very important that Virgin Galactic make a genuine commercial success of this project. "If we do I believe we'll unlock a wall of private sector money into both space launch systems and space technology," he said. Whiletoday?s show-and-tell festivities marked a major milestone, the true test of theWhiteKnightTwo and its flying attributes are still ahead here atthe Mojave Air & Space Port. Rutan notedthat ?you can?t have schedule pressure before you fly?because that?s not a safething to do. In terms of what the schedule will be to complete, you reallydon?t know anything until you start flying,? he continued, calling it adownsizing of the uncertainty. ?You don?tknow when you?re going to be done until you march through the research flighttests,? Rutan emphasized. Rutan saidthat the WhiteKnightTwo/SpaceShipTwosystem is not a Burt Rutan design. ?We?ve gotsome very talented people?so the credit for thinking and having the courage totry belongs to them,? he said, underscoring the expertise of such people as BobMorgan, JimTighe, Matt Stinemetze, and Pete Siebold?part of a team of some 20 engineersthat worked on the endeavor. ?Of course, they had to sell me on it,? he added. TheWhiteKnightTwo could be ready to do a space launch with only 40 flights — ?ifeverything works,? Rutan said, ?but more than likely we?ll run a few more thanthat.? 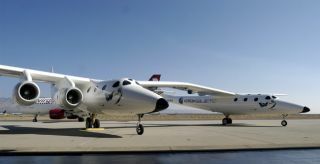 Largely drivenby the need to snag market share of the public suborbital space tourismbusiness, Rutan said that the WhiteKnightTwo/SpaceShipTwo system is designed toyield a top-notchflight experience. For one, SpaceShipTwo offers a roomy — yes, call it spacious — passenger cabin withgreat windows to afford a ticketed traveler a stunning sight, Rutan said. Passengersriding in the WhiteKnightTwo launch aircraft will be provided a spectacularview as well — with SpaceShipTwo peeling away and blasting skyward towardspace. ?Riding inthe launch airplane to watch a launch is going to be a cool thing to do,? Rutanpointed out. Moreover,WhiteKnightTwo will serve as training ground — albeit in the air — for futurespace travelers. The mega-plane can provide stints of microgravity fornext-in-line SpaceShipTwo flyers, Rutan noted, with the aircraft also able togive clientele six to seven Gs to mimic the forces encountered during asuborbital space jaunt.? ?For us,this rollout is a really important event,? said Will Whitehorn, president ofVirgin Galactic. ?We?re going to be flying in a couple of months?ground testingstarts almost immediately after this event is over,? he told SPACE.com. Whitehornsaid that as soon as that ground evaluations are finished and everyone issatisfied ?we?ll put it into the air?perhaps in a few weeks or it could beabout eight weeks at the maximum.? Whitehornadded: ?When we are all happy?then it will start flying. That could be verysoon?but there?s no exact date.? In terms of money spent on the spacelinersystem by Branson?s Virgin Group to date, he explained: ?We?re at 100 milliondollars that has been spent so far.? As for thereadiness of the suborbital SpaceShipTwo, Whitehorn said that the vehicle is nowabout 70 percent complete. ?Whether ornot we fly the spaceship into space next year?it?s too early to say. But theambition will be to fly it by the end of 2009 or early 2010 into space,?Whitehorn explained. Spotlightingthe scope of what WhiteKnightTwo can provide on its own, Whitehorn offered some suggestions: ?I think the market forWhiteKnightTwo will be a lot bigger than we?ve estimated.? In additionto supporting suborbital space travel, Whitehorn said the WhiteKnightTwo carrierplane can satisfy a rangeof market needs from satellite launchings to deploying unmanned aerialvehicles, or toting large quantities of water to help squelch raging fires, aswell as hauling hefty amounts of cargo from point to point. "I really think we're on the threshold of a new era of commercial space transportation," said George Nield, head of the Federal Aviation Administration's commercial space transportation office in Washington, D.C. "This just makes it real?because we've got some hardware coming together and test flying starting. It's going to be an exciting next couple of years," he told SPACE.com. Stuart Witt, General Manager of the Mojave Air& Space Port, said there?s a significance that might be missed giventoday?s rollout of WhiteKnightTwo. ?It?s allabout results,? Witt told SPACE.com. ?That?s why people come to Mojave. TheWhiteKnightTwo/SpaceShipTwo?they are one more example of a result that willyield breakthroughs in aerospace. Here at the Mojave Air and Space Port, we?reall about results.? Witt saidthe Air & Space Port is ready to support WhiteKnightTwo and theSpaceShipTwo test program. ?I am looking forward for Scaled Composites to get back into the rockettesting business?and on we go! ?